Starlings entering roost site, near Gretna Green. After a quiet Christmas at home, Jane and I started out on a journey that would eventually take us as far as Stranraer for a New Year reunion with some old friends. I had planned some bird-photography-related visits en route; it would be difficult to pass through Gretna Green in late afternoon – on a sunny day – without trying to locate probably the most well-known starling roost in the UK! Research on the internet had told me that it was now no longer at Gretna itself but a couple of miles west near the village of Rigg. Some photographs had showed the site to be close to two parallel lines of electricity pylons so it wasn’t too difficult to find. One bird photographer was already in attendance and she said she believed she was in the best place to photograph the great gathering of birds. As sunset passed it became apparent that they were rather further away than she expected, and it was necessary to use my longest lens, the Tamron 150-600 zoom. By this time perhaps ten other photographers were present. Birds certainly congregated and swirled around in very large numbers, but it was well past sunset before they began to form the amoeba-like formations which I had hoped for. I had increased my ISO to 3200 by this time, and shutter speeds were rather too long for comfort. At 4.25 p.m. there was a crescendo of shutter clicking as the starlings formed a funnel shape and tumbled down into a small forestry plantation. This was what we were all there for! Within 60 seconds the birds had gone and the whole event was over. I decided that, as far as possible, I would use one of the electricity pylons to anchor the composition within the landscape. I felt that the large bird of prey (probably a buzzard) perched on top of it added an extra layer of interest to the image. As it turned out it was a good decision and it was not difficult to find the best couple of images from the sequence. Following some judicious cropping to create a square-format image, this is the one that immediately registered in my mind and stayed there. Fortunately the 1/320th second exposure was short enough to prevent bird movement being recorded on the sensor. 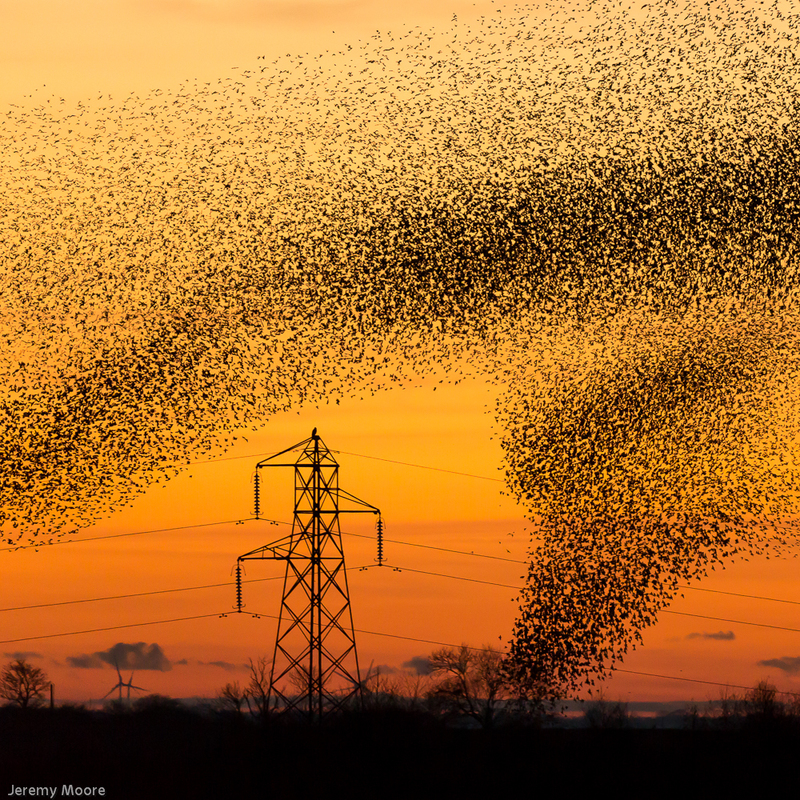 This entry was posted in Uncategorized and tagged bird photography, green, gretna, murmuration, roost, starling, starlings. Bookmark the permalink. 2 Responses to This is what we’re here for! Amazing photo – I’m very envious of that experience! It’s not too far from Newcastle to Gretna, Andrea! I can tell you where to go if you like….. But bear in mind that the birds were further away than they look.